Join us in Brooklyn on March 6 for our first-ever scavenger hunt! Click here to register. January 24, 2019 — Measure of America and the Nonprofit Coordinating Committee of New York present DATA2GOHEALTH.NYC in the webinar “Unlocking Potential: New Health-Related Data for Decision Making & Community Well-Being.” Click here to watch. January 2, 2019 — Measure of America’s Rebecca Gluskin presents findings from A Portrait of NYC at a Brooklyn Borough Board meeting. Click here to watch. March 15, 2018 — Webinar. Kristen Lewis participated in “New Data on Youth Disconnection: State of Opportunity Youth in San Diego County,” a webinar unveiling the latest numbers on disconnected youth in San Diego calculated by Measure of America. The data is part of a collaboration between the San Diego Workforce Partnership and Measure of America to assess youth disconnection, set goals and track progress in the county. You can watch the recorded webinar and see the slides. For more information on the effort to reduce youth disconnection in San Diego, visit OpportunitySD.org. March 25, 2018 — Washington, DC. Measure of America’s Sarah Burd-Sharps will speak at the National Association of Workforce Boards Annual Forum about Measure of America’s collaboration with the San Diego Workforce Partnership to address youth disconnection in San Diego. Click here for more information about the event. March 6, 2018 — New York, NY. Co-director Sarah Burd-Sharps will participate in a panel organized by NYU’s GovLab for NYC’s Open Data Week, along with representatives from the Mayor’s Fund to Advance New York City, Viacom, and the Sunlight Foundation. The “If You Build It, Will They Come? A Case for Demand-Driven Data” panel will discuss the demand for open data. Click here to find out more about the event. November 29, 2017 — Washington, DC. Measure of America will join other organizations using data to expand opportunity at the US Census Bureau’s Opportunity Project. MOA’s Laura Laderman will demo DATA2GO.NYC and discuss how the tool can help with outreach for Census 2020. Click here to watch live at noon! November 29, 2017 — Los Angeles, CA. The Southern California Grantmakers will host an event to launch Measure of America’s latest well-being report, A Portrait of Los Angeles County. The event is open to the public, click here for more information! September 26, 2017 — Los Angeles, CA. Measure of America’s Kristen Lewis will present a sneak peek of our upcoming Portrait of Los Angeles County report at the Southern California Grantmakers annual conference. For more information, click here. September 20-21, 2017 — Pittsburgh, PA. Measure of America’s Partnerships Specialist Vikki Lassiter will be a speaker at MANY’s Connection 2017 event, which brings together actors working to improve outcomes for youth from various sectors. Click here for more information and tickets, and here to see Vikki’s introduction. October 4, 2017 — Los Angeles, CA. Measure of America co-director Sarah Burd-Sharps will participate in the Health, Wealth, and Housing: Promoting Cross-Sector Collaborations for Equity Conference hosted by the Federal Reserve Bank of San Francisco. Sarah will discuss the latest research and evidence-based strategies that move the needle on improving the quality of life for low-income families with other expert panelists. August 4, 2017 — Albuquerque, NM. Measure of America’s co-director Kristen Lewis will be a speaker in a meeting about the role of philanthropy work in the Southwest in contributing to the universal Sustainable Development Goals (SDGs) co-hosted by the Council on Foundations, Philanthropy Southwest, and Albuquerque Community Foundation. For more information, click here. July 12, 2017 — Washington, D.C. Measure of America’s Vikki Lassiter will speak at Bringing Education Home: Affordable Housing and Education Summit, hosted by the Council of Large Public Housing Authorities (CLPHA). The summit brings together experts and senior staff from the nation’s largest public housing authorities with the goal of foster peer-to-peer problem-solving, sharing of best practices, and networking. May 25, 2017 — Los Angeles, CA. Measure of America co-director Sarah Burd-Sharps participated in the County of Los Angeles’ 2017 Commissioners’ Leadership Conference, Embracing a Changing Demography as a speaker. Sarah presented the upcoming Portrait of Los Angeles County report to the County’s public policy community. The program booklet and a video of Sarah’s presentation are available online. April 19, 2017 — Chicago, IL. Measure of America co-director Kristen Lewis facilitated LeadersUp’s Career360 Innovation Session, a day-long convening of young adults, employers and community partners to brainstorm new solutions to help disconnected young adults achieve workforce readiness in Chicago. Kristen presented Measure of America’s latest findings on youth disconnection and led the group discussions. Read the white paper synthesizing the day’s findings here, and watch a video of the innovation session here. Investments in Employment Opportunities for Opportunity Youth Are Investments in Our Communities and Our Nation, a discussion with youth, community leaders, advocates, and experts about the Opening Doors for Youth Act, which would expand federal investment to maintain youth connected to school and work. Measure of America co-director Kristen Lewis will participate as a panelist and discuss the latest data and findings on youth disconnection. To RSVP, click here. March 26, 2016 — New York, NY. Measure of America and the National League of Cities Institute for Youth, Education, and Families will host a joint webinar on MOA’s latest youth disconnection report. The expert panel in “Moving the Needle on Youth Disconnection: Insights from Measure of America’s New Report: ‘Promising Gains, Persistent Gaps: Youth Disconnection in America’” will feature MOA co-directors Sarah Burd-Sharps and Kristen Lewis, as well as NLC YEF Institute’s Director of Youth and Young Adult Connections, Andrew Moore. You can click here for more details, and register here. October 30, 2015 — Washington, D.C. An amicus brief by The American Civil Liberties Union and the ACLU of Texas for the Supreme Court case Fisher v. University of Texas cited Impact of the US Housing Crisis on the Racial Wealth Gap Across Generations, a report by Measure of America and the ACLU. See the amicus brief here. November 22, 2016 — New York, NY. Measure of America co-director Sarah Burd-Sharps will testify in a Youth Services Committee hearing on youth disconnection on November 22 at 10 am. The full testimony can be found here. October 13-14, 2016 — New York, NY. Measure of America co-directors Sarah Burd-Sharps and Kristen Lewis will present “Who Needs Race Relations: New York and Global Human Rights”, a paper on well-being and inequality in New York City, at the NYU Wager Graduate School of Public Service. The panel discussion at the Walter Stafford Symposium: Structure of Race and Inequality in New York City will feature New Economy Project Co-Director Sarah Ludwig. The event is open to the public, please RSVP here. October 31, 2016 — Denver, CO. “A Portrait of Sonoma County”, the Measure of America report commissioned by the Sonoma County Department of Health Services (DHS), will be presented at the American Public Health Association 2016 Annual Meeting and Expo in Denver. The “Ensuring the Right to Health: Engaging Stakeholders to Improve Community Health Equity” roundtable at 12:30 pm on Oct. 31 will discuss the success of the efforts spearheaded by the Sonoma County DHS in creating local dialogue on health equity in Sonoma County around the findings of the report, and the use of the Human Development approach in understanding and communicating about health disparities. More information can be found here. September 30 through February 26, 2017 — Measure of America work will be featured in the Cooper Hewitt, Smithsonian Design Museum’s third exhibition in a series about socially responsible design, “By the People: Designing a Better America”. The exhibition will delve into the challenges that urban, suburban, and rural communities face and feature 60 design projects, including MOA’s interactive data visualization, “Mapping the Measure of America”, which was designed by longtime MOA collaborator, the artist and designer Rosten Woo. For more info, click here. March 26, 2016 — Washington, D.C. Measure of America co-director Sarah Burd-Sharps will speak on a panel on youth disconnection hosted by U.S. Rep. Bobby Scott of the House Committee on Education and the Workforce. The event will bring together experts, advocates and youth to discuss the causes of youth disconnection and ways to improve outcomes for at-risk and disconnected youth. June 8, 2016 — Brooklyn, NY. Measure of America co-director Sarah Burd-Sharps will present Measure of America’s work, especially DATA2GO.NYC, at FitCity 2016. FitCity is an annual conference that convenes stakeholders across diverse disciplines such as architecture, public health, urban planning, academia, and community development, to champion the role of design in creating healthy neighborhoods. More details about the event can be found here. May 11, 2016 — Brooklyn, NY. Measure of America will release its first DATA2GO.NYC report: High School Graduation in New York City: Is Neighborhood Still Destiny?. This report contributes to the ongoing discussion around high school choice and outcomes in the City by presenting the on-time graduation rates for high school students not by the schools they attend, since those data are already available, but rather by the neighborhoods they call home, and by exploring the relationship between neighborhood-level social and economic indicators and graduation rates. April 16, 2016 — Queens, NY. Measure of America co-director Sarah Burd-Sharps will present at the April meeting of the Queens Borough Cabinet. She will host a workshop demoing DATA2GO.NYC. April 1, 2016 — Staten Island, NY. Measure of America co-director Sarah Burd-Sharps will present at the 2016 Staten Island Not for Profit Conference. She will host a workshop demoing DATA2GO.NYC as a “free, easy and efficient data analysis and mapping tool that [nonprofits] can start using to make cases for support right away.” For more details, including a link to RSVP, go here. March 26, 2016 — Brooklyn, NY. New York City Councilmember Robert E. Cornegy Jr. is hosting the 2016 State of the District event, at which Measure of America will be part of a workshop using DATA2GO.NYC to gain a better understanding of what District 36 (Bedford-Stuyveasant and northern Crown Heights) needs and how it’s doing. For more details, including a link to RSVP, go here. March 18, 2016 — New York, NY. Measure of America co-director Kristen Lewis will be speaking at “The Global Goals in New York City,” a conference convened by the Council on Foundations, the SDG Philanthropy Platform and Philanthropy New York. She will be discussing how work already underway in New York City supports the universal Sustainable Development Goals (SDGs). For more details, go here. March 9-11, 2016 — Baltimore, MD. Measure of America co-director Sarah Burd-Sharps will be speaking at the inaugural conference hosted by the Robert Wood Johnson Foundation dedicated to building a transdisciplinary evidence base for a Culture of Health. She will be discussing measures for answering the question, “What is a good life?” The discussion will move beyond traditional measures, such as QALYs and DALYs, and dive into measures for assessing well-being and advancing health equity drawing on global examples. For more details, go here. January 29, 2016 — Washington, D.C. Measure of America co-director Kristen Lewis will present a speech on “Economics and Mentoring: A National Urgency” at the 2016 National Mentoring Summit. The workshop will provide a compelling overview of urgent and often overlooked economic dimensions confronting vulnerable or disconnected youth that bear national attention during an important election year in our country. More details here. November 20, 2015 — Washington, D.C. From 8:30 to 9:15 AM, Measure of America co-director Kristen Lewis will provide a keynote address to set the stage for the 2015 Opportunity Youth Network Summit. She will cover Measure of America’s recent research on youth disconnection and frame the OYN’s goal to reconnect one million youth. For more information on the summit, click here. December 2, 2015 — New York, NY. From 2:45 to 4:30 PM, Measure of America co-directors Sarah Burd-Sharps and Kristen Lewis along with Tamara Fox of the Helmsley Charitable Trust will present in a workshop-style interactive demonstration of DATA2GO.NYC. Participants will be able to pitch their data needs and see if the tool can help address them. Even if you’re not a New York City funder, this program can help you think about what you might do to inspire the creation of new data sources that help you be a better grantmaker. For more details, see here. October 28, 2015 — New York, NY. From 8:30 to 9:30 AM at Civic Hall, the Measure of America team along with selected presenters will launch DATA2GO.NYC, a free, easy-to-use mapping tool to visualize and analyze well-being and inequality in NYC. Presenting will be John R. Ettinger, CEO of the Helmsley Trust, Matthew Klein, Executive Director of the Center for Economic Opportunity and Senior Advisor to the Mayor’s Office of Operations, and Cynthia Esposito Lamy, Metrics Manager for the Robin Hood Foundation. The event is free and open to the public. For more information, click here. Please RSVP here. June 23, 2015 — Washington, D.C. From 1:00PM to 2:00 PM, Sarah Burd-Sharps and representatives from the Center for American Progress, U.S. Department of Housing and Urban Development, Consumer Financial Protection Bureau, and American Civil Liberties Union will have a panel discussion on the findings of our recent research exploring the impact of the U.S. housing crisis on the racial wealth gap across generations. The event is hosted by the ACLU in their offices at 915 15th Street NW, Washington, D.C., 20005. You can find the official invitation here. Please send RSVPs or questions to dcintern_oa@aclu.org. May 27, 2015 — 7:30 AM – 5:00 PM, San Francisco, CA. Measure of America co-director Kristen Lewis will be describing the state of California at the opening session of the Northern California Grantmakers Annual Conference. Following her presentation, both PolicyLink Founder and CEO Angela Glover Blackwell and University of Southern California Professor of Sociology and American Studies & Ethnicity Dr. Manuel Pastor will address the conference. This conference is open to NCG members and non-member funders. For more details, see here. April 13, 2015 — Sacramento, CA. 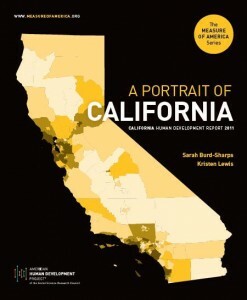 From 3:00 to 4:00 PM, Measure of America co-directors Sarah Burd-Sharps and Kristen Lewis will be briefing the California Legislature and interested parties regarding findings of A Portrait of California 2014–2015. They will be introduced by Assembly Speaker Toni G. Atkins and United Ways of California CEO Pete Manzo. The event is open to the public; interested parties should contact Bryan Ha of United Way at bha@unitedwaysca.org. You can see the video of Assembly Speaker Atkin’s speech here. December 15-16, 2014 — from 15:00 to 17:30, Measure of America Chief Statistician Patrick Guyer will be at Kansai University in Osaka, presenting Measure of America’s work on conceptualizing and applying well-being gauges at the community level. Several local well-being projects in Japan are being spearheaded with the advice of Kansai University Professor Takayoshi Kusago, who will be moderating this discussion. Contact us for more information on this event. November 19, 2014 — from 4:30 to 6:00 PM, at 142 Goldwin Smith Hall, Measure of America co-director Kristen Lewis will speak at Cornell University. She is being hosted by the Cornell University Center for the Study of Inequality. She will present Measure of America’s exploration of well-being and opportunity in the United States using the American Human Development Index, a composite index comprised of indicators on health, education, and living standards. Measure of America is the only source of life expectancy calculations for different racial and ethnic groups as well as for states and for smaller populations within states in the U.S. today. October 1, 2014 — Alan Flippen of NY Times’ The Upshot will moderate a discussion hosted by The Municipal Art Society of New York and Measure of America. The panel comprises a diverse group of experts, policy makers, corporate and philanthropic foundations, and non-governmental organizations working on designing policies in regions and cities that improve their livability, their sustainability and the quality of life of the people who live and work within them. Co-Director of Measure of America, Sarah Burd-Sharps, to be featured among the panelists. Location: The Municipal Art Society of New York | 488 Madison Avenue, Suite 1900, 9-11am. Public event. Space is limited. RSVP required. For availability, contact: csmith@mas.org. November 12, 2014 — Measure of America co-directors Kristen Lewis and Sarah Burd-Sharps will be participating in a discussion at the Kaiser Family Foundation’s Conference Center in Washington D.C. The conference, called “Health Data for the Common Good,” is a meeting of public and nonprofit organizations engaged in measurement and online public reporting of U.S. population health and health system performance. November 5, 2014 — Measure of America co-director Sarah Burd-Sharps will moderate a panel discussion on resilience at the Southern California Grantmakers Annual Conference. More information here. October 1, 2014 — The Municipal Art Society of New York and Measure of America are convening a roundtable discussion on: “Mapping Well-being and Opportunity for Resilient Communities Around the World.” The event will be held at The Municipal Art Society of New York. Measure of America co-director Sarah Burd-Sharps will be delivering a keynote address. October 1, 2014 — Measure of America co-director Kristen Lewis will deliver a keynote presentation at the Second Annual Convening of the Opportunity Youth Network in Washington, D.C. The Opportunity Youth Network is part of The Aspen Institute Forum for Community Solutions. Measure of America co-director Kristen Lewis will be presenting at the Maricopa County Education Service Agency’s first Disconnected Youth Summit on May 7, 2014. Kristen will be presenting Measure of America’s research on disconnected youth, which caused the summit to be convened. Measure of America co-director Sarah Burd-Sharps will be presenting at The Office of Minority Health and Community Science Webinar: Building Community Capacity to Use Index Data on Social Determinants of Health. Sarah will be presenting information on Measure of America’s feature mapping program on Thursday, December 19, 2013, 3:30 – 5:00 EST (click here to register). Sarah Burd-Sharps will chair a panel on Managing Disasters: Readiness, Then Response at the Milken Institute in Los Angeles. View event details here, and event program here. The Institute for Economics and Peace and Measure of America co-directors Sarah Burd-Sharps and Kristen Lewis are hosting a discussion around the launch of the 2012 United States Peace Index: The Social and Economic Impact of Violence in the U.S.
Join Measure of America Co-Directors Sarah Burd-Sharps and Kristen Lewis, and those with a keen interest in using the Index to address the challenges facing ordinary Americans, as we examine a new way to understand well-being and access to opportunity in America today. View event details here. AHDP Co-Director Sarah Burd-Sharps spoke on a panel at the Opportunity Nation Summit in New York City on November 4th. Opportunity Nation’s mission is to promote opportunity, social mobility, and access to the American Dream. See more here. AHDP Co-Director Kristen Lewis will address the Latino Community Foundation in San Francisco on October 21, 2011. The Latino Community Foundation’s mission is to create a future where all Latino families are safe, healthy, and full participants in the civic and economic life of California. Learn more. AHDP Co-Director Kristen Lewis will offer a nonpartisan, fact-based look at how ordinary people in communities across California are faring. She will be joined by: Sushma Raman, President of Southern California Grantmakers, and Edmund Cain, Vice President of the Conrad N. Hilton Foundation. This event is open to the public with an RSVP. RSVP for the event. AHDP Chief Statistician Patrick Guyer will speak at the Canadian Risk and Hazards Network Symposium (CRHNet), held in Ottowa on October 19, 2011. CRHNet symposiums aims to contribute to the creation of a disaster resilient society through inter-disciplinary and inter-jurisdictional dialogue and collaboration among practitioners, policy makers, researchers, and academics. Register for the Symposium. AHDP Co-Directors Sarah Burd-Sharps and Kristen Lewis will present their research, “Beyond GDP: Using the American Human Development Index to Identify Need and Assess Impact,” at the RAND Corporation in Los Angeles on October 19. RAND is a nonprofit institution that helps improve policy and decisionmaking through research and analysis. Learn More. AHDP Co-Director Kristen Lewis will address The San Joaquin Valley LEAP (Latino Environmental Advancement & Policy Project) in Fresno. Valley LEAP . AHDP Co-Director Sarah Burd-Sharps will speak at the San Diego Grantmakers 2011 Annual Conference on October 18. The conference is the premier gathering of grantmakers from throughout San Diego County, bringing together members of the philanthropic community to learn, share information, and connect with each other to improve philanthropy’s positive impact in our communities. Register for the event. In collaboration with Spotlight on Poverty, AHDP will be hosting a webinar on Friday June 3, 2011, from 12:30 – 1:30 p.m. EST, on how to utilize the Common Good Forecaster. Created with the United Way, the Forecaster uses Census data to forecast the impact of increased educational attainment on such factors as health, civic engagement and crime. AHDP Co-directors, and Health People founder and executive director, Chris Norwood, will speak. RSVP for the webinar. AHDP’s Co-director Sarah Burd-Sharps is the Capstone Speaker for the graduating class of Brandeis University’s Heller School of Social Policy and Management. AHDP will be touring California to launch A Portrait of California, a timely assessment of the well-being of Californians and their unique human development challenges. The lecture series, “Health, Education, and Income in an Age of Austerity,” will feature AHDP’s Co-directors, prominent community advocates, policy experts, and members of the philanthropic community. The events will take place in Sacramento on May 17, Los Angeles on May 18, and San Francisco on May 20. RSVP for these events today. On Thursday March 31, 2011, American Human Development Project Co-Directors Sarah Burd-Sharps and Kristen Lewis will be featured speakers at a discussion of the recently-released The Measure of America 2010-2011 in Washington, DC. The event will take place from 12:15 PM to 1:45 PM at the New American Foundation (NAF), and will be moderated by NAF Economic Growth Program Policy Director, Michael Lind. Light refreshments will be served. RSVP for the event here. On Wednesday March 16, 2011, AHDP Co-Directors Sarah Burd-Sharps and Kristen Lewis, and Statistician Patrick Guyer presented the findings of The Measure of America 2010-2011 to UNICEF Policy and Practice staff. Co-directors Kristen Lewis and Sarah Burd-Sharps will be joined by Congressman Chris Murphy (CT-5) Wednesday, March 2, in a briefing on the The Measure of America 2010-2011: Mapping Risks and Resilience for policymakers and staffers. Co-Director of the American Human Development Project, Kristen Lewis, will be a keynote speaker at Southern California Grantmakers (SCG) Public Policy Conference on Tuesday February 15, 2011. The event will take place at the Center for Healthy Communities, Los Angeles, California, and also feature breakout sessions lead by public and community leaders in philanthropy and research. Read more, and register for the event. Big Gaps in the Big Apple: Lessons from The Measure of America, November 17, 2010. See what the new 2010-2011 American Human Development Index reveals about the distribution of opportunity in America, with a special focus on the New York metro area. The expert panel and book party is open to the public, and will take place at 6:30 PM on November 17, 2010, at NYU’s Institute for Public Knowledge (Light refreshments served). Read more here, forward this invite to friends, and RSVP to astoller@groupgordon.com, 212.784.5715. Hear the latest findings of the American Human Development Project’s updated 2010-2011 Index of well-being and opportunity. The Washington, DC launch of The Measure of America 2010-2011: Mapping Risks and Resilience will take place at the Kaiser Family Foundation, at 9 AM on November 10, 2010 (Breakfast served at 8:30 a.m.). Learn more here and RSVP to astoller@groupgordon.com, 212.784.5715. Co-director Kristen Lewis will give the opening lunch plenary at the Association of Small Foundation’s “Katrina @ 5: Partners in Philanthropy” conference, taking place on Monday, March 22, 2010, at the New Orleans Marriott. For more information, visit www.KatrinaAtFive.org. Co-Director Kristen Lewis will present The Measure of America to the Episcopal Church conference “Called to Serve: The Church Responds to Domestic Poverty,” from 3:00 to 4:30 PM on Wednesday, April 28, 2010. For registration information, please visit the event’s website. Co-director Sarah Burd-Sharps and Advisory Panel member Carla Javits will present the results of the American Human Development Project to invited guests of the San Francisco Foundation. The presentation will focus on the implications of the Project’s work for the State of California. February 8, 2010, from 8:30 AM to 10:30 AM at the San Francisco Foundation, 225 Bush Street, Suite 500, San Francisco, CA. For invitation information, please contact Scott Owens, sjo@sff.org, by Feb. 1. Co-directors Lewis and Burd-Sharps will present their new work to a public audience at the Public Affairs Building, UCLA School of Public Affairs, at 4:00 PM. Drawing on data from the American Human Development Index and the U.S. Census Bureau’s American Community Survey, “Philanthropy In/Sight” is a one-of-a-kind data visualization platform for better understanding the impact of philanthropy throughout the world. Sarah Burd-Sharps presents “The Measure of America: Moving Beyond Wealth to Measuring Progress” as part of the National Civic Summit in Minneapolis: 3PM, Friday, July 17, Minneapolis Hilton Salon Stage. “The Measure of America: Bringing Human Rights Home” to be aired at 3:00pm on Chicago Access Network TV21 featuring a panel discussion with co-director Sarah Burd-Sharp. For those in Illinois, Sarah Burd-Sharps, Co-director of the Measure of America, is scheduled to speak on a plenary panel for the state on December 10, 2008. “Measuring Human Development in America,” was presented at the Altarum Institute, a DC-based nonprofit health systems research and consulting organization serving government and private-sector clients. For those in SoCal, the authors of The Measure of America will be giving a plenary speech at the Southern California Grantmakers 35th Annual Conference on November 19th. The Measure of America co-author Sarah Burds-Sharp will join others on a panel to discuss the meaning of human rights in the United States. Sponsored by the Sargent Shriver National Center on Poverty Law, the dialogue will take place on Friday, October 17, 2008 at 8:15am CDT in Chicago, IL. For more information, please visit the event’s website. The authors of The Measure of America, Sarah Burd-Sharps and Kristen Lewis, will be presenting a series of tele-seminars sponsored by The Foundation for American Communications (FACS). The next two seminars are scheduled for October 1st and 8th at 2:00pm ET and will cover the topic of education disparities. Afterwards on October 14th and 21st, there will be two additional teleseminars on standard of living at 2:00pm ET on each of those dates as well. For more information and to register for free, click here. The American Human Development Project released “The Measure of America” on July 16th at a news conference held at the National Press Club. In the days before the launch, co-authors Kristen, Sarah and Eduardo made courtesy calls to the offices of a number of senators and representatives, particularly those in the bottom congressional districts and states, in order to share the report, explain the findings, and answer questions.